The 1915 Russian cavalry stethoscope, courtesy of Dr. Yulia Frumer, history of science. It’s one thing to read about an old technology; it’s another to use it. Historians of medicine often critique the technologies and practices of past medical practitioners, making claims primarily based on texts, not materials. Yet one of the new trends in the history of science, technology and medicine is physically using objects and following recipes based on historical evidence and instructions. For example, historians and scientists at the University of Uppsala in Sweden are recreating early modern European pharmaceutical recipes to understand the labor and ingredients they took to produce. Johns Hopkins’ own history of science professor, Lawrence Principe, has applied his Ph.D. in chemistry to medieval and early modern alchemical texts, unlocking and following their instructions to reconstruct alchemical recipes to see if they actually worked or, at the very least, what they produced. Dr. Yulia Frumer, in the same department, also teaches an undergraduate course on the history of instruments in science and technology. She has her students use artifacts like old thermometers and examine machines like the Ford Model T to help them expand their sense of potential sources for historical analysis. 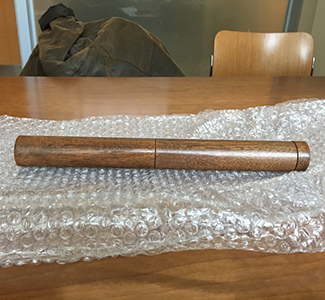 The replica of Laennec’s early 19th-century stethoscope, courtesy of the Institute for the History of Medicine. I was one of the four teaching assistants who, along with Dr. Comfort, also had the opportunity to use the stethoscopes. We paired up, one person sitting on the desk or a chair with his or her back turned to the other. The second person then placed the stethoscope at three points on the back: the right shoulder blade, the middle of the back and close to the small of the back. When I used them on my partner, I moved backward in time. I began with Maya’s 21st-century stethoscope, which was handy to use. 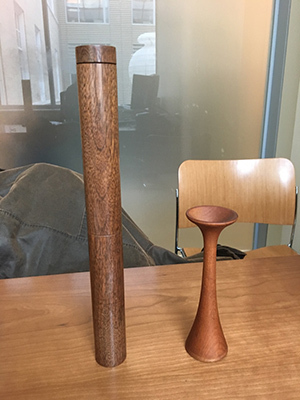 I moved to the 1915 stethoscope, an hourglass-shaped wooden instrument. It was a bit more difficult to hear my partner’s breathing, and it took work to make it lie flat against the back. The wider end pressed against the back while I held the narrower end to my ear. followed his instructions, and the difference was shocking — I could hear my partner’s breathing much more loudly! Both stethoscopes side by side. Employing and handling this series of stethoscopes ultimately changed the way we thought about Laennec. Reading the text and following its instructions made for different experiences, one mental, the other phenomenological. In Michel Foucault’s The Birth of the Clinic, Foucault argued that Laennec, Bichat and other members of the early 19th-century Paris Clinic focused on the disease instead of the patient. To Foucault, the Paris Clinic turned patients into bodies without voices. However, by using Laennec’s stethoscope, we began to understand the work and sensations that accompanied clinical pathology. Placing the stethoscope in the right place required you to negotiate with the patient, not just his or her body. Furthermore, the experience solidified what historian Jonathan Sterne argued in The Audible Past: Through the stethoscope, listening in the medical profession became a refined technique that required specific technologies. We understood through sensation what Sterne meant and wondered if he, too, had once used this stethoscope. Finally, we came to sympathize with Laennec’s struggles in hearing his patients’ breathing. We were using his tool in a quiet teaching assistant office and had trouble hearing. He invented the stethoscope in Paris’ Necker Hospital, a busy place full of coughing, screaming and probably retching patients. Perhaps it is unsurprising, then, that Laennec invented what he did. 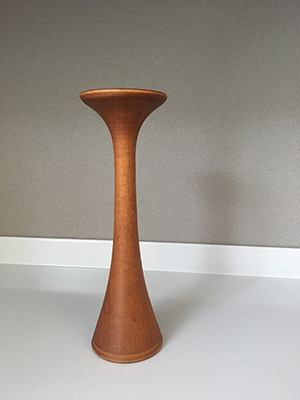 The stethoscope helped him train his ear on one patient at a time, listening to their sounds and creating an intimate space in a public hospital. The Institute for the History of Medicine is now showing the Laennec replica in an exhibit called “Tuberculosis: Treating the Body Politic in America,” by museum studies student Dana Murray. The exhibit is located on the second floor gallery of the Welch Library building. One Comment on "19th-Century Technology, 21st-Century Users"
The rigid stethoscope works MUCH better when not encumbered by clothes. Prior to this tool clinicians placed their ear directly on the patient’s naked back. Obviously listening to HEART sounds in females posed real problems. For the times, using the amplification of the rigid scope and letting the clinician be a bit away from the patient, was a huge advantage. Eventually it also led to the ability to better describe and interpret heart sounds, a tremendous advance.